The 15 Minute ‘Tempest’ (1986) – entire text. I have a few more of these 15 minute plays to add. Sacrifice of the Green King (1991) – extract. This play takes the folktale of Robin Hood and inter weaves it with the events of the reign of King John. I will re-work this idea as an oral storytelling tale, and add it to the Tales page. It was also inspired by the songs of Rog Patterson. Modern Man (1983) – monologue. Written as an audition piece for a Theatre Studies course. Inspired by studying Hamlet (the first Shakespeare I studied). It is similar to Theatre of the Absurd, which I am rather chuffed to say I had never read when I wrote this. So I kind of invented it again. Shakespeare (in the bath): Full fathom five thy father lies! Of his bones are corals made. Monster, I do smell all horse piss at which my nose is in great indignation. Gonzalo: Down with the top mast; yare; lower, lower; bring her to try with main course! Sebastian: A pox o’your throat! You bawling, blasphemous, incharitable dog! Antonio: Hang, cur, hang! You whoreson! Insolent noise maker, we are less afraid to be drowned than though art. All: (as they exit diversely) Mercy on us! We split, we split! A princess; no worst issue. What foul play had we that we came from thence. Prospero: The government I cast upon my brother. To cry to the sea that roar’d to us! Ariel: (Enters) All hail, great master! grave sir!, hail I come. Prospero: What is the time o’ the day? Into a cloven pine. Where thou dids’t rent thy groans. Caliban: O ho, O ho! – would it had been done! Ferdinand: This ditty does remember my drown’d father. Gonzalo: The air breathes upon us here most sweetly. Antonio: Save means to live. And were the king of it, what would I do? Sebastian: Scape being drunk, for want of wine. Gonzalo: I would such perfection govern, sir. Sebastian: As thou got’st Milan. Alonso: Why, how now, ho! Awake! Why are you drawn? Like Bulls, or rather lions; sure it was a whole herd of lions. From bogs, fens, flats, on Prosper fall! Lo! now Lo! Caliban: Do not torment me O! Stephano: Four legs and two voices; a most delicate monster. I will kneel to him. I’ pr’ythee be my god. Stephano: I do assure thee: I was the man I’ the moon. Here; bear my bottle. O now brave monster lead the way. Caliban: Ban ‘Ban, Ca – Caliban. Has a new master – Get a new man. I’ll bear the logs a while. Will’t please you taste of what is here. Hath caused to belch up you. I have made you mad! From Milan did surplant good Prospero. Upon your heads, – in nothing but heart’s sorrow. To make this contract grow. What Ariel, my industrious servant, Ariel! Ariel: (Enters) What would my potent master? Of the beast Caliban and his confederates. As dreams are made of, and our little life is rounded with a sleep. (To Ariel) Spirit we must prepare to meet with Caliban. Ariel: I go, I go. Trinculo: Monster, I do smell all horse-piss; at which my nose is in great indignation. Caliban: Within this half hour will he be asleep. Stephano: Be you quiet monster. ‘steal by line and level’ is an excellent pass of pate. Monster lay to your fingers; help to bear this away. How fares the king and his followers? In virtue than in vengeance. Go release them Ariel. Now useless, boil’d within thy skull! The wronged Duke of Milan, Prospero. Prospero: Thy rankest fault,- all of them. I also forgive. Alonso: A most high miracle! Take with you your companions. Was I to take this drunkard for a god! (Aside) Please you draw near. Ferdinand: O, if a virgin. 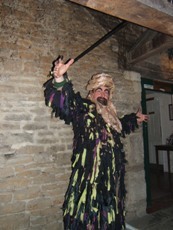 Caliban: O ho, O ho! Miranda: I am your wife. Ariel: I have made you mad! Prospero: Behold, The wronged Duke of Milan, Prospero. Trinculo: I do smell all horsepiss! Alonso: Thy dukedom I resign. Miranda: O brave new world! Shakespeare: (Suddenly wakes from this nightmare and sits up in the bath and shouts) I’ll drown my books! ROBIN: This is the time. Your own purpose has brought you jointly to this place. You butchered, you homeless, you beggars and paupers. And you with wounded consciences who dare to stand up for your fellow men. This purpose goes to the very heart of us all. Even in our weakness and pains, it gives life and strength. Scarlet is dead. Friar Tuck is to be hanged, tomorrow at the gallows oak. Your families are taxed out of home and a living, and some to the grave. Women and children are beaten bloody and left to starvation, while weak souls look on, clinging ever more frantically to their crumbling way of life. Some people come here to seek refuge from the worlds problems, to be free of them. They can’t escape the troubles of this island, any more than we can the perils of life. So they must be of a mind with us. There is no more flight, so we must fight. The taxing has turned to axing. The very heart of this land now suffers with you. More pain to pay for their warring ways. Timber for money and ships. The last props of this dying state. The land on which we stand is left fallow. Farms decay without tenants, as people starve. High summer has become barren winter. So the land, this rich and wondrously diverse land, in which we all share, the foundation on which all is built, even she is dying. ROBIN: If it fails, nothing will succeed. England our mother, who bore us in her sheltered forest arms, suckled us with the sweet waters from her hills, birds on her breath, and from fertile loins abundant food. You her children, who come to her seek comfort and peace, now looking like gnarled oaks. twisted by the growing storm, struck down by heaven’’ lightening and aged in advance of your years by woes. You were rejected by the nation, and return to nature. The crown that sits about England’s oak doth shrink and crack the growing heart wood, crowns and kings, flags and armies are not England. This is the fiction of the Conquerors kindred. The land is England. So reject this family and its emblems, remember again your loyalty rests with eternal England, and not with its temporal tenant over-lord. ROBIN: Now don her colours, become true Englishmen. Bind your purpose to her with these garlands, her flags and legal leaves. Kneel, and let your knees imprint your seal in the earth. ROBIN: And as you resolve to protect her, her colours shall protect you in her realm. Your cloak of green will mingle with hers and render you invisible. With skin of bark, ivy cheek, stick finger, and mossy hair. A thousand Jack-in-the-Green could hide in a copse. From your mouths you must speak this leafy message, and this will cloak others, so the seeds I have planted in your minds will spread through out the land. Harvest all you can. Sow and reap for all our sakes. Spread the green through the land. Block the tributaries of this stinking state. Clog and suffocate their draining ditches. Stop the bleeding. ROBIN: Go now. You must tend to your own. I will muster what I can to save the Friar. From whence we shall to Nottingham to bring down Normandy and his Norman tyranny! MAN: Shall I do it or shall I not do it, that’s the question. (Pause) So what’s the answer? I think I’d better take stock of the situation and assess my surroundings. (Pause. Looks around.) Well, there doesn’t seem to be any immediate threat in here. Only a few dark corners, and of course the door, myself, and a comb. (Finds a comb in his pocket.) Well. As I seem to have assessed the situation, I think it’s time for me to make a decision. Am I going to open the door or not. (Pause) I think I need some more information. (Pause) This door. (Walks over to examine the door) It’s not too small to get through, nor so big that it can’t be moved. Well, there’s no light so I can’t see what’s on the other side. No draughts, or obstructions to prevent the door from opening. (He gets oil on his fingers through examining the door) Oh, its well oiled. No dry rot or damp, and a nice smooth finish too. It doesn’t seem to be locked, so I’ll go straight ahead. (Long pause) But I haven’t examined the consequences yet. (Pause) Yes, I think I’d better. That’s very consequential. I mean there could be absolutely anything on the other side. I’ve nothing to go on to give me any idea of what’s behind that door. (Pause) It could be a room full of dynamite or a ravenous tiger. (Gradually moves away from the door) There could just be a cliff which I’d fall over and plummet to my death. Or a pool of ferocious piranhas which I’ll take an unsuspecting dip in. Or even worse, the door could open out underwater, so if the piranhas don’t get me I’ll be smashed against the wall by the force of the water. (Pause. He has now returned to his starting position) No, I don’t think so. Piranhas don’t live in this climate, perhaps another small shoal species. May be sprats. (Pause. Considers and feels reassured. Sits) Perhaps there’s nothing there at all. (Pause. Considers again and feels a little uncertain) Just nothing. (Pause. The uncertainty grows) Lots of nothing. An endless black void in which I’ll wander forever, and ever, and ever. (Pause) Perhaps, it’s a seemly harmless field of poisonous mushrooms. (Pause) Mushrooms. (Pause) Food. (Pause) I’m hungry. There’s no food in here is there? (Stands up and looks around) No. Doesn’t look like it. I’d better see if I can find some in… (Tentatively) yeah. I never thought of that. There could be all sorts of good food in there. Piles and piles of it. Masses and masses. Or even money, yeah, great! Millions and millions. Billions and billions. I’d be a millionaire! (Pause. Moves closer to the door) May be I’ll meet the girl of my dreams, or even a whole harem. (Pause) Yeah, just imagine that! (Very long pause) Or even someone just like me wandering what’s on the other side. (Pause) Ah, what if he isn’t friendly? (Pause) He could even be armed with a knife, an axe, or even a machine gun. Crumbs! I think I’d better take up a defensive position. (Moves far away from the door and tries a series of locations to stand ready) Here, no, I’m in direct line of fire. Here, no, the door then would be in the way when he enters. Here, ah yes. I can be see him as soon as he opens the door. And he can see me. (Pause) Well I think it’s best to take up a central position. (Returns to starting position) Yes that’s it. And stand edge on to decrease the surface area to attack, and so increase my chances of survival. (Pause) Now, a weapon? (Tries pockets) Ah, my comb, well it’s all I’ve got and it’s better than nothing. It’s good solid steel. A bit thin, but still good and solid. It’s a pity it’s not sharp, but it’s still. (Tries the strength of it and it snaps) Oh. It’s snapped. (Pause) Perhaps fists are better after all. (Pause) Ah ha! It may be shorter now but at least it’s sharp. Right, I’m ready. (Very long pause) Why don’t I attack first. Element of surprise. The best form of defence is attack as they say. Yes, now which hand, my left? Yes, that’s the strongest. So open with right and stab with the left. No, I’ll get my arms knotted that way. Right, I’ll stab with my right and open with my left. (Purposefully moves to the door and almost takes the door handle) But the handle might be electrified. (Pause. Returns to the starting position and sits) Yes, I’d better wait, and see what develops. (Pockets comb. Very long pause) Well, at least in here I’ve got four walls, a floor and a roof over my head. Light. Warmth. Conversation. (Pause) There are no leaks or draughts. In fact it’s so nice I think I’ll stay, and see how the situation develops. Yes, that’s much the best way. It’s a pity there’s no food, but something’s bound to happen. (Pause) Eventually. (Very long pause. Regards the door several times) Now the question is. Shall I do it, or shall I not do it.